For millennia, humankind has expressed their heartfelt gratitude for the life-sustaining nourishment of food through the rituals of prayer, meditation and simple quiet moments of contemplation. The many expressions of gratitude that are contained in this book have evolved over time. They come from all corners of the earth, perhaps initially sung or spoken by candle light in the inner sanctums of monasteries, around massive feast-laden tables, or possibly over meager meals eaten by the fireside under the moon and stars. They’ve been offered not only as thanks for what is visible in the form of food, but for the invisible, immeasurable elements–the life sustaining miracle inherent in breaking bread. 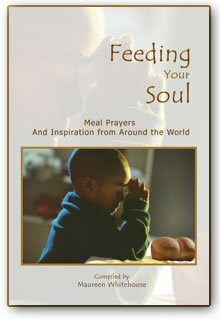 These prayers and petitions are complimented and further elevated by food inspired short stories and vignettes illustrating that mealtime is the perfect opportunity to bless, to acknowledge the miraculous in the mundane, and to realize we all are ultimately nourished by the same Source. This book is offered with the hope that you will find treasures within it and possibly feel inclined to share them and even hand them down for millennia to come. I hope it will be for you an inspired passageway that brings you closer and closer to the Divine inherent in all, until you find the doorway opened wide that ever beckons us to be consumed–to enter in and fall into the heart of God.